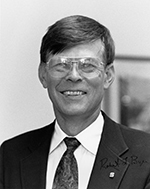 Robert L. Byer researches lasers and nonlinear optics. He has spent his career working at Stanford University and has held various positions including Professor of Applied Physics, Vice Provost and Dean of Research, and Director of the Center for Nonlinear Optical Materials. May 9, 1942Birth, Glendale (Calif.). 1964Obtained BA in Physics, University of California, Berkeley, Berkeley (Calif.). 1967Obtained MS in Applied Physics, Stanford University, Stanford (Calif.). 1969Obtained PhD in Applied Physics, Stanford University, Stanford (Calif.). 1969 – presentAssistant Professor of Applied Physics (1969-1974); Associate Professor of Applied Physics (1974-1979); Chair, Department of Applied Physics (1980-1983); Professor of Applied Physics (1979-present); and Chair, Department of Applied Physics (1999-2002), Stanford University, Stanford (Calif.). 1975 – 1982Co-Founder, Quanta-Ray Lab, Spectra-Physics. 1976Fellow, Optical Society of America. 1984 – 1985President, Lasers and Electro-Optics Society, Institute of Electrical and Electronics Engineers (IEEE). 1984 – 1986Associate Dean, Humanities and Sciences, Stanford University, Stanford (Calif.). 1984 – 2005Member, Board of Directors, Lightwave Electronics Corporation. 1987Member, National Academy of Engineering. 1987Fellow, Lasers and Electro-Optics Society, Institute of Electrical and Electronics Engineers (IEEE). 1987 – 1992Vice Provost and Dean of Research, Stanford University, Stanford (Calif.). 1989 – presentMember (1989-1999); Chair (1995-1998); and Fellow (1999-present), California Council on Science and Technology. 1992Fellow, American Association for the Advancement of Science. 1992 – 1999Member, Directed Research and Development Program Committee (1992-1995) and Director, Advisory Committee (1996-1999), Lawrence Livermore National Laboratory. 1992 – 2000Director, Center for Nonlinear Optical Materials, Stanford University, Stanford (Calif.). 1993 – 2000Member, Governing Board, American Institute of Physics. 1994 – 1995President, Optical Society of America. 1995 – 1998Member, Committee on Optical Sciences and Engineering, COSE (1995-1998) and Member, Committee on Inertial Confinement Fusion (1996-1997), National Research Council. 1997 – 2006Director, Hansen Experimental Physics Laboratory, Stanford University, Stanford (Calif.). 1998Fellow, Laser Institute of America. 1998 – presentMember, Board of Directors, General Lasertronics Corporation. 1999 – 2000Member, NIF Task Force, Secretary of Energy Advisory Board, United States Department of Energy. 2000 – 2002Member, Board of Directors, PolyStor, Inc.
2000 – presentCo-Director, Stanford Photonics Research Center, Stanford University, Stanford (Calif.). 2000 – presentMember, Advisory Committee, National Ignition Facility, Lawrence Livermore National Laboratory. 2001 – 2003Member, NIST Advisory Board and Physical Panel Vice Chair, National Research Council. 2002 Member, International Advisory Board, RIKEN. 2002 – 2003Member (2002) and Member, Ad Hoc Strategic Planning Committee (2003), California-Mexico Commission on Education, Science, Technology. 2002 – 2006Member, Scientific Advisory Board, United States Air Force. 2002 – 2006Chair, External Advisory Board, Center for Adaptive Optics. 2003 – 2006Member, Program Advisory Committee, Laser Interferometer Gravitational Wave Observatory (LIGO). 2004 Member, International Advisory Board, RIKEN. 2004 – presentMember, Science Advisory Committee, Linac Coherent Light Source, Stanford Linear Accelerator Center (SLAC). 2005 – presentMember, International Advisory Committee, Canadian Institute for Photonic Innovations. 2006 Member, International Advisory Board, RIKEN. 2006 – 2009Director, Edward L. Ginzton Laboratory, Stanford University, Stanford (Calif.). 2007 – 2008Member, Board on Army Science and Technology - Directed Energy Study, National Research Council. 2009Chair, Board of Directors, Mobius Photonics (bought out by IPG Photonics). Vice Provost and Dean of Research. Obtained MS (Applied Physics) in 1967 and PhD (Applied Physics) in 1969. Assistant Professor of Applied Physics; Associate Professor of Applied Physics; Professor of Applied Physics; and Chair, Department of Applied Physics. Co-Director, Stanford Photonics Research Center. Director, Hansen Experimental Physics Laboratory. Member and Member, Ad Hoc Strategic Planning Committee. Chair, Board of Directors (Mobius Photonics). Member, Directed Research and Development Program Committee; Director, Advisory Committee; and Member, Advisory Committee, National Ignition Facility. Member, Committee on Optical Sciences and Engineering (COSE); Member, Committee on Inertial Confinement Fusion; Member, NIST Advisory Board and Physical Panel Vice Chair; and Member, Board on Army Science and Technology - Directed Energy Study. Member, Science Advisory Committee, Linac Coherent Light Source.